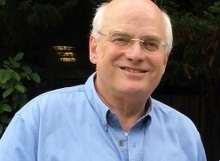 Rotarian Dr Antony Warren is a retired Cambridge GP. He is Chairman of the Foundation of Edward Storey almshouse charity, which houses 110 residents on four sites and gives hardship grants to over 200 others. He is a lay member of the Animal Welfare Ethics Review Board (AWERB) at the Wellcome Sanger Institute and he is also a qualified Local Observer for the Institute of Advanced Motorists, mentoring drivers who wish to take the advanced driving test. His main hobby is choral singing to a high amateur standard and he has performed all over Europe with one or other of the several choirs he sings with. Rotarian Neil Whiteside appears regularly on local radio. 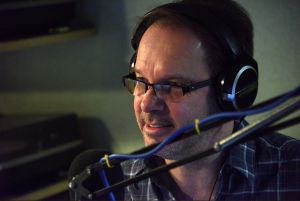 Neil handles Outreach & Community Development for Cambridge 105 Radio and appears regularly on the station with his own programme. Cambridge 105 Radio is the community radio station for the city of Cambridge. A volunteer-run, community-owned, not-for-profit organisation. The station broadcasts from its studios on the Gwydir Street Enterprise Centre across the City and South Cambridgeshire on 105FM, online and DAB Digital Radio seven days a week. Neil also covers IT support on a freelance basis and is helping to develop a mobile App and in his spare time Neil is a radio ham. 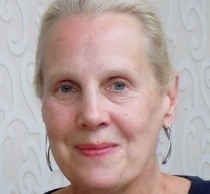 Rotarian Clare Waterhouse runs her own relocation business, Cambridge Property Search Limited. Founded in 2007 her business became successful and is now thriving. Clare started with work from the Judge Business School and now has contracts with all of Cambridge University. In her spare time she teaches English and American Literature at the U3A and has an interest in art and art history as well as an interest in Russian and Spanish cinema. Rotarian Jenny Chapman-Hay is the former Business Editor of The Cambridge News. 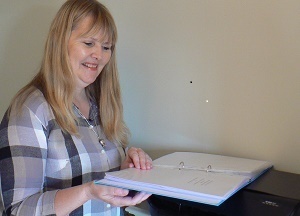 Jenny has written a number of books, both novels and non-fiction and since retiring she has started a small antiques business. She also tackles the Daily Telegraph cryptic crossword and enjoys reading. Rotarian Rosemary Turner helps with Victim Support for those who have experienced criminal incidents. Rosemary also has three dogs from unsettled homes that she exercises twice a day with her husband John. That is George in the photo. Formerly she was Head of Education at Meldreth Manor Scope School for youngsters with profound and multiple learning difficulties. Rotarian Julian Landy started Homes for the Homeless in 2017 with a mission to reduce rough sleeping in Cambridge. Julian wants to almost eliminate rough sleeping in Cambridge within 5 years. He is no longer doing any professional work since he retired but he is intending to write books. He has finished one book with three others on the go. He started Friends for the National Trust for Scotland raising about £15,000 since this was formed and has also launched a dual-gender book club in Cambrige. Rotarian Patsy Glazebrook BEM was awarded her British Empire Medal in the New Year's Honours in 2015 for her work with charity. This was for her work with the the Sick Children's Trust Charity which was founded by her in 2000 and raises funds for the ongoing maintenance of Acorn House and Chestnut House at Addenbrooks Hospital. Patsy has recently retired after 47 years in the Nursing profession and is also one of the Assistant County Organisers for the Cambridgeshire National Garden Scheme. Rotarians Ed & Gill Coe have a passion for opera and classical music. Our picture shows them at Glyndebourne this summer where they enjoyed the more and more ambitious productions with superb soloists from around the world. Ed was a Chartered Quantity Surveyor and a partner of one of the foremost QS firms in the UK and latterly worldwide. He has recently retired as a Trustee of the Arthur Rank Hospice where he was involved with planning and building a new hospice. The whole Trustee and medical team are delighted with the end product completed on time and to budget. Rotarian Paul Henry has been a member of our Club for over 30 years. In the Rotary Club of Cambridge Paul is always ready to lend a hand and outside our club he assists with the Arthur Rank Hospice as well as continuing to take a business interest in home improvements and specifically conservatories, doors and windows. 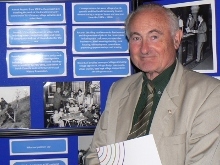 Rotarian Colin Greenhalgh was Principal of Hills Road Sixth Form College. In 2003 he was appointed CBE for services to education. A lifelong cricketer, Colin is a member of MCC and kept wicket for Jack Frost Cricket Club after his 75th birthday. 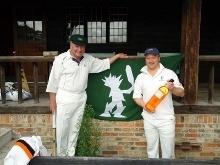 Colin is seen in our picture wearing his green Jack Frost Cricket Club cap. He was also Vice Chair of Cambridge University Hospitals and currently, he is a Deputy Lieutenant of Cambridgeshire, Vice Chair of Cam Academy Trust and an Honorary Fellow of Anglia Ruskin University. Rotarian Peter Jones is a keen cruising sailor and has his own yacht. Although retired he is very involved in Camsail and is a member of BENERA, the Cambridge Rambling Club and the U3A. Rotarian Johnnie Sam is vice chairman of Ridgeons who are one of the largest privately-owned builders' merchants in the UK. Johnnie is also a Governor of Hills Road Sixth Form College and a trustee of the charity Break. 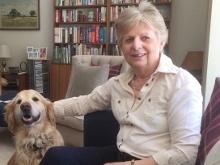 Rotarian Francis Hookham works with Dementia Compass, a not-for-profit organisation who offer an on-going community programme designed especially for people living with dementia. 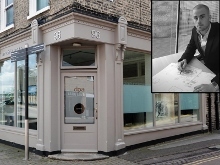 Before he retired, Francis was a founding partner of Pleasance, Hookham and Nix the well known Cambridge surveyors based in Northampton Street, Cambridge. 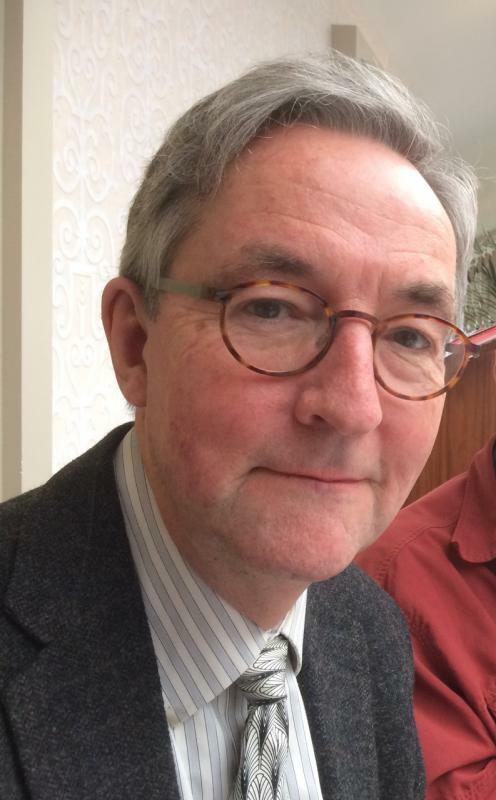 Rotarian John Grieve plays viola in the City of Cambridge Symphony Orchestra since retiring from his well known and eponymous Cambridge veterinary practice and composers played over the past 12 months range from Copland through to Wagner. 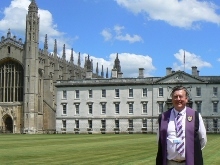 Amongst his other commitments John is Visits Organiser for Cambridge Society for the Application of Research. Rotarian John Barrett is seen here with Amanda Goodman the BBC Television personality during our winter concert at the West Road Concert Hall. John is a fomer president of the World Methodist Council and also has had an illustrious career as an educationalist. He was well known in Cambridge as the headmaster of the Leys School for 14 years and was the first Principal of the international Anglo-Chinese School in Singapore. 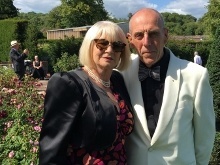 Rotarian Paul Auton, seen here with his wife Colette on the occasion of the recent opening of the Auton Building on the Cambridge Science Park, is the former CEO of Cambridge Consultants where he grew the company from under 100 to over 300 with most work coming from the private sector and around 50% overseas. 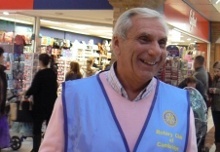 Rotarian John Martin is a former chairman of Cambridge Magistrates and is seen here taking part in our Children in Need collection at the Grafton Centre. A retired builder John was formerly Eastern Area Chairman of the Federation of Master Builders and is a trustee of the Cambridge Royal Albert Benevolent Society. Rotarian Chris Senior's growing reputation as one of the lead designers in Cambridge is a result of his intuitive approach. Visit his website http://www.dpaarchitects.co.uk/ for more information. Chris's early entrepreneurial leadership was recognised and encouraged by the Rotary Club where he is now a full member. 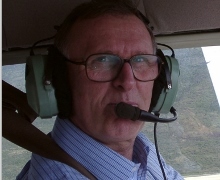 Rotarian Rudolf Hanka is a keen amateur pilot. "Flying keeps you so busy that you can't think of anything else and you land with your mind completely refreshed". He is also the Chief Scientific Adviser to the Czech Government, a former Vice-President of Wolfson College and a Professor of Medical Informatics. After an illustrious full-time career in Local Government, focusing on education, Rotarian David Spreadbury is a Board member of Cambridgeshire ACRE where he has furthered his interest in the Rural Community Council movement. Rotarian John Mott's whole life has been devoted to the Salvation Army. 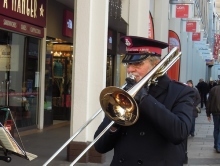 Since retiring from active service after nearly 30 years as a full-time officer (minister) in 1998 he has worked in Cambridge, both in fund-raising and in music and is a familiar local figure. 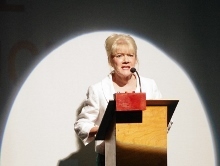 Rotarian Sally Stewart is involved in around three drama productions a year at either the ADC theatre or the Playrooms at the Arts Theatre. Sally either directs or acts in productions which are staged by the two main Cambridge production groups. 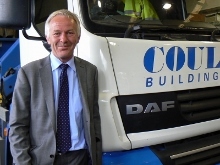 Rotarian Philip James is chairman of the Coulson Building Group which has been established for 130 years and turns over £13m per annum on building projects throughout East Anglia. 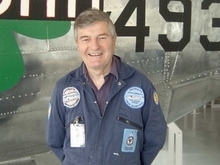 Having retired from a busy career, culminating as the District Manager of a national building society, John now finds time to help with conservation work at Duxford Airfield.